Twenty years ago, medicine and surgery rounds used to start in the reading room. Sitting in a dark room with a viewbox and an alternator, a senior radiologist greeted visiting clinical teams every day and reviewed their patients’ films. With the advent of digitization and picture archive and communication system (PACS), the last 20 years saw a rapid evolution of radiology. We read studies faster than ever, and radiology workflow focused extensively on the interpretation of images and the associated diagnostic report. Recently, there has been a revival patient-centered care and communication. 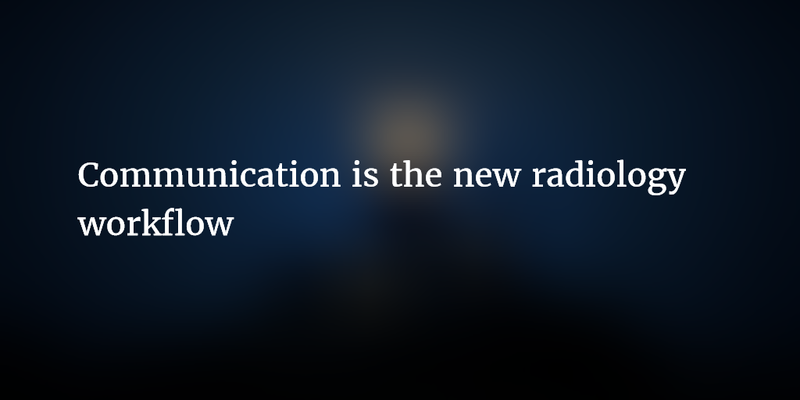 Communication is the new radiology workflow. I had the pleasure of writing about the importance of communication in radiology in a previous post. Just this month, a group at Beth Israel Deaconess Medical Center writes in American Journal of Roentgenology that despite our focus on critical value communication, the bulk (52%) of errors in radiology communication actually occur outside of results. While most communication errors did not cause patient harm, 37.9% did affect patient care. The radiology value chain, of course, begins as early as the decision to image and extends well into appropriate follow-up imaging of identified lesions (Enzmann, Radiology 2012). Maybe it’s time we as radiologists take ownership of the whole imaging process, from the decision to image all the way to follow-up. New AJR paper finds a majority of communication errors in radiology occur outside of results notification.